Magic Spells, by Apple Computer, is designed to give drill and practice in spelling. The program is divided into two parts: (1) a word-unscrambling game, and (2) a teacher's utility which allows the creation of word lists. The game is set in the Castle of Spells. Merlapple, the Wizard of Spells, guides the player into the castle, where there are treasures which the player has a chance to win. Unfortunately, though, a demon also lurks in the castle, and he has his eyes on the gold. To play the game, the child first selects the word list he or she wants to be drilled on. The words are listed out, and the child is instructed either to copy the words or to just pay close attention as they're listed. The 12 word lists included on the diskette each contain 16 words. When the player is finished looking at the words, they disappear, and one closed treasure chest appears on the screen for each word on the list. Then one of the spelling words appears on the screen, with the letters scrambled. The child is supposed to unscramble the letters to spell out one of the words that was on the list. If the word is typed in correctly, the treasure chest pops open and the gold is revealed. 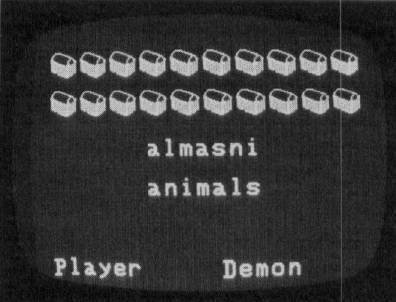 The scorekeeping part of the screen displays the player's and the demon's points. Two points are accrued for each letter in the word. If the child takes more than one try to spell the word correctly, points are split with the demon. In this case, a demon holding a money bag takes the place of the closed treasure chest. If the child has to consult the demon for help (by typing an asterisk), the demon gets all points, and an empty treasure chest appears on the screen. This procedure continues for each of the words on the list. The order of the words is random, as is the scrambling of the letters. At the end of the game, the child receives a reward based on his or her score. A typical reward is getting to make a wish on a beautiful unicorn. The second part of this program, the teacher utility, allows the creation of word lists that are appropriate for each class setting. A menu for the teacher utility specifies the options, which include entering a list of words, deleting a list of words, viewing a list of words, seeing a list of file names, and copying a list on the printer. Up to 20 words can be entered in each list. This will accommodate most weekly spelling lists found in elementary school spelling books. The lists will be automatically saved on diskette, unless the disk drive contains the Magic Spells master disk, which comes write protected. The correct diskette to have in the drive is the Magic Spells backup, which is not write-protected. My "kid consultants" for this program truly enjoyed the game. They found unscrambling the words a lot of fun. Lisa, seven years old, struggled to unscramble each word, and then never looked at the scrambled letters as she typed in the letters to spell the word correctly. It took her about a half-hour to get through one word list, but she wanted to try another when she was through. She conscientiously wrote down the words in the list when they appeared at the start of the game. Chrissa, eight years old, did not want to ask the demon for help, preferring to wangle the help out of other people in the room. She felt that the game was hard, but enjoyed it enough to want to borrow the diskette. Cara, ten years old, played the game for about 45 minutes, and said she didn't really think she'd like to use it again. The program seemed to pass the kid test. However, I feel that it fails to do what it is designed to do — give drill and practice in spelling. Spelling is a recall rather than a recognition task. When we try to spell a word, it is rare indeed for us to have the letters there in front of us in scrambled form. We need to pull the letters from memory. This program does not give such practice. One way recall can be practiced would be through a tape recorder link-up with the computer so that a child would actually hear the words. A second way would be for each word to flash on the screen for a long enough time to be read, and then be erased before the child begins typing it in. A third possibility would be for the program to generate sentences with the target word omitted. Some of the word lists on the diskette contain words that children misspell because they choose the wrong homonym. Words like "there" and "their" are in the lists, as are "to", "two", and "too". Avoiding these misspellings would be helped only with practice using them in sentences. Unscrambling their letters is of no value whatsoever. A relatively minor problem with the program is the length of the game. Each game could take up to 40 minutes. This is longer than the amount of time children typically have on a computer at school. If a child needs to stop playing before the game is over, the ESC key will allow an escape from the game. However, when this option is exercised, no score summary is presented, and no reward is given. Unscrambling spelling words in Magic Spells. The documentation for this diskette gives information about the game in an interesting, clear fashion. Screen photographs add a lot to its understandability. It gets a little confusing when it gives instructions for making backup copies of lists of words, however. The major confusion is whether the manual is referring to the Magic Spells backup diskette or another backup diskette. A teacher or parent new to the computer would probably need some help understanding to which disk the instructions are referring. This program has potential, but I feel it should be revised. Although the kids love the game, the teacher utility works well, and the flow of the program is appealing and makes logical sense, it should be reworked to include an educationally sound way of giving practice in spelling words. The program, written by Leslie Grimm, comes with a master and a backup and runs on an Apple II Plus with 48K.